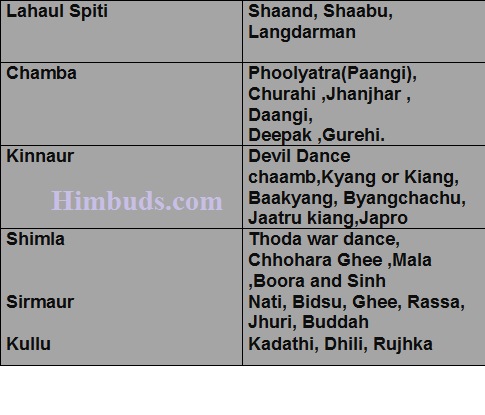 Focusing on the need of the hour wherein maximum youth of Himachal Pradesh are actively preparing for Himachal Pradesh Naib-Tehsildar Examination, HimBuds.com brings to you the Complete list of Dances of Himachal Pradesh for preparation of NT Examination. It will help the candidates expand their knowledge and prepare well for the examinations. In Himachal there is a very long list of dances for every occasion, in every form and unique to every region. These dances are mostly performed at the local fairs and at happy occasions like marriages, Festivals, Changing season and coming of the devta. Women and men dressed up in their traditional attire, dance away to glory. They express their feeling very happily. These dances have enabled them to passionately move forward their traditions which can never be considered complete without dancing. These dances have also enabled them to passionately move forward their traditions which can never be considered complete without dancing. So,Focus on these Key points Himbuds provide you Complete list of Dances of Himachal Pradesh in single platform. Kinnaur Devil Dance chaamb,Kyang or Kiang, Baakyang, Byangchachu, Jaatru kiang,Japro. Shimla Thoda war dance, Chhohara Ghee ,Mala ,Boora and Sinh. Sirmaur Nati, Bidsu, Ghee, Rassa, Jhuri, Buddah,Padua and Dangra. Kullu Kadathi, Dhili, Rujhka, Ujgjama. sir thanks for sharing this infomation. Thanks Deepak. Your website is an excellent one. Do let me know if we can collaborate in any way.